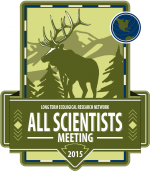 The 2015 Long Term Ecological Research (LTER) All Scientists Meeting (ASM) will take place from August 30 to through September 4, 2015. Please mark these dates on your calendars. The main travel day for most LTER scientists will be Sunday, August 30, with most departures on Thursday, September 3. LTER Information Management, Grad Student, Education, and Executive Board representatives will have pre-ASM meetings on August 30, with their arrival date on Saturday, August 29. The 2015 ASM Program Committee invites suggestions for topics and activities. Suggestions for the meetings can be submitted on the meeting website (http://asm2015.lternet.edu/), which also has a tentative meeting agenda and information. Thanks to supplemental funding to the LTER Network Office (LNO) from the National Science Foundation, some travel funds will be available for students, information managers, education representatives, scientists, and other site personnel. The LTER Executive Board will decide how these funds will be made available, and this information will be sent to Site Principal Investigators at a future date. The ASM will take place at the YMCA of the Rockies in Estes Park, Colorado, venue of several previous meetings. The location was selected by the LTER Science Council based on a survey of previous participants that showed a majority favoring a return to Estes Park. Selection of meeting dates was also influenced by preferences expressed in the survey and to reduce conflicts with major holidays and other meetings. The 2015 meeting will be one day shorter than the 2012 meeting and be designed to efficiently use the time without reducing meeting content, particularly allowing time for the many working groups and related meetings that lead to future LTER research activities, publications, databases, and other products. A call for working group proposals will be issued early in 2015, so please start discussing topics to enhance research opportunities with your colleagues. The 2015 ASM Program Committee will be arranging an exciting agenda based on previous meetings, while taking into account the many comments received by LNO on how to further improve the meeting. The Committee will work to identify a small number of interactive plenaries that will integrate with the working group activities. With your help, we plan to make this the best ASM ever. Group photo of participants at the 2012 LTER All Scientists Meeting at Estes Park, Colorado.